When MitM first met Gregg Stebben, he was helping guys get hooked up with the best health advice in Men's Health magazine. 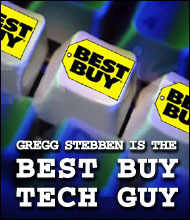 Then, he quit and got the coolest job ever... he became the Best Buy Tech Guy! Now, Gregg helps guy get hooked up with the sweetest technology on the market today!